Playing co-op with strangers is about it get easier, as Bungie adds a bunch of new playlists to Halo: Reach in a mid-month update. What do you do when you get a hankering to play a game co-operatively, but there's no one else around? Usually, you'd have to try your luck online, but throwing yourself on the mercy of the internet can be a risky business, as you never know who'll you're going to end up with. At least one game is about to get ever so slightly less risky however, as an upcoming update for Halo: Reach means that you'll at least be guaranteed someone who has a similar skill level to you. In the most recent Bungie weekly update, community manager Brian Jarrard said that, pending final testing and review, Bungie would be adding Campaign matchmaking to Reach next week, along with some tweaks to other playlists. Bungie also hopes to include dedicated Infection and Sniper playlists, again, pending testing and review. Jarrard said that the finalized details would be part of the next weekly update, due on Friday. 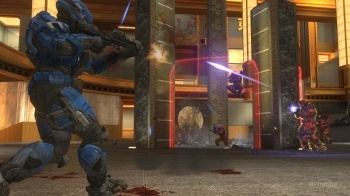 Also on the cards are community made maps appearing in standard matchmaking, although Jarrard says that before that happens it will work with Halo community groups to create a community map playlist as a test bed, before putting the best of the best into standard rotation. Additionally, Bungie is in talks to create official Major League Gaming and Grifball playlists, which Jarrard hopes will be ready before the holidays.